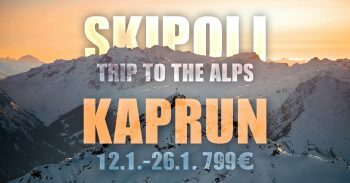 This year Skipoli is heading for the small village of Kaprun where the glacier of Kitzsteinhorn makes sure that the area has snow throughout the year. The area is full of free skiing possibilities for experienced off-piste enthusiastics and for beginners as well. Zell am see, also in the valley, provides kilometers of cruising on the slopes with unique lake side view. For park shedders the valley has various snowparks to offer from beginner to experienced levels. Highest lifts will take you up and over 3000 meters and overall there are 138 kilometers of slopes to choose from. Straight flights from Helsinki toward Münich take off 12.1.2019 09:20 and we arrive back to Finland on 26.1.2019 22:15. The flights include 2 baggages/skibags. Sign up for the trip on 1.10.2018 at the lobby of the main building (Otakaari 1) and pay the 150€ reservation fee and your in. The overall cost for the trip is 799€ including the flights, busses, accommodation and to be announced extras! This year we will take 36 powder hungry skiers and snowboarders, don’t miss your chance!